Hand-held Portable Test Set for Field Test Applications | Marvin Test Solutions, Inc.
programmed to execute user defined test routines. The MTS-3060C is extremely rugged and flightline qualified, making it the ideal test instrument for any demanding field test applications. The MTS-3060C SmartCan™ can also generate audio and video signals. Two channels of audio and one channel of video can be simultaneously generated. An innovative power management system allows operation of the SmartCan for over 40 hours without the need to replace the standard AA batteries. This extended operation is achieved using sleep modes and drawing power from the UUT when available. With a sunlight-readable LCD display and multi-function keys, the MTS-3060C SmartCan™ provides the flexibility to support a range of automated test applications. During test execution, the display’s background color indicates test status with green denoting a passing test and red denoting a test that failed. The LCD can also display the actual test results of the last test run. All connections to the UUT are via a rugged, MIL circular connector located on the rear of the unit. With a sunlight-readable LCD display and multi-function keys, the MTS-3060 SmartCan™ provides more capabilities, more test instructions and more test information than any other battery-operated hand-held tester. During tests, the display’s background color indicates test status with green denoting a passing test and red denoting a test that failed. The LCD can also display the actual test results of the last test run. The MTS-3060C SmartCan™ includes Built-In-Test (BIT) capability that provides verification of major circuits. A comprehensive Self-Test verifies the MTS-3060C’s performance including the cables and adapters using a selftest adapter. BIT and Self-Test can be performed in the field or at the back shop, no special external test equipment is required other than the self-test adapter. The MTS-3060C SmartCan™employs an innovative calibration technique that further simplifies maintenance and reduces scheduled maintenance down-time and associated logistics. Multiple NIST-traceable, high-precision references have been incorporated into the design of the SmartCan™, and the MTS-3060C verifies its calibration status against these references every time the self-test is performed. In the event the MTS-3060C is out of calibration, the test set initiates an automated calibration procedure that calibrates the MTS-3060C measurement and stimuli devices against the built-in references. The references have to be checked once every 4 years using external transfer standards and can be done in the field, minimizing down time of the test equipment. 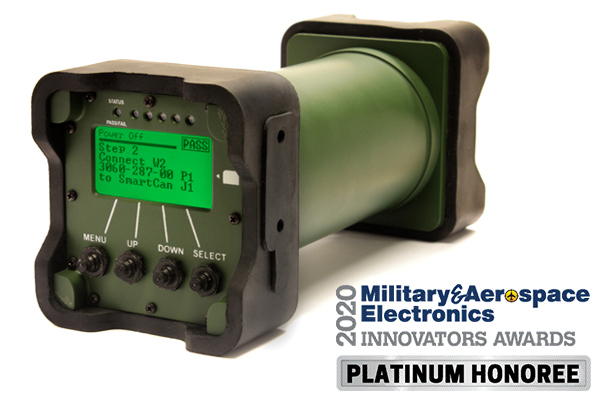 The rugged construction of the MTS-3060C SmartCan™ facilitates field operation anywhere in the world. The MTS-3060C’s ability to operate in adverse weather conditions makes it the ultimate tool for field test applications. Additional protection has been included in the MTS-3060C to minimize equipment damage if the SmartCan is dropped by the user. The MTS-3060C is ergonomically designed for ease of use and will not roll when placed on angled surfaces. The MTS-3060C SmartCan™contains Ethernet and USB interfaces, allowing log files from an executed test program to be easily moved to a computer for printing and analysis. This feature is especially important when failures occur and the availability of data for further analysis is critical to the timely repair of field units. The MTS-3060C’s USB interface also simplifies firmware updates without the need to ship the test set back to the depot or to the manufacturer. Additional test programs supporting new or revised UUTs can also be updated via the USB interface. Applications for the MTS-3060C are developed using Marvin Test Solutions' ATEasy - a Windows based, test executive and software development envirornment. A dedicated tool set, ATEasy- SmartCan allows users to develop and compile applications off-tester. The compiled application can then be downloaded via the MTS-3060C's USB interface. A training class is available for SmartCan software developers. Display and Indicators Sunlight-readable graphic LCD display with a resolution of 128 x 64 pixels and six different background colors. Individual indicators to support legacy mode operation.